In 2 Sizes - 50mm/2" H or H 54mm/2 1/4"
Clean, clear Quartz Crystal eggs. 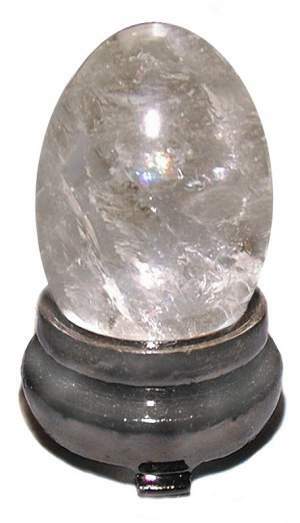 They have beautiful phantoms and rainbow inclusions, mostly clear in quality Brazilian Quartz. Also great for scrying or placing in palm for meditation. The Walnut Finish Egg Stand is included.